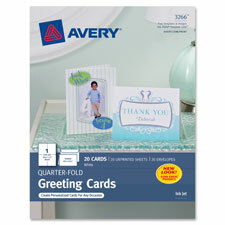 Print your own elegant greeting cards, announcements and invitations with heavyweight quarter-fold greeting cards. Simply design on your computer and print with your inkjet printer. Cards are scored for easy folding and include matching envelopes. Made of high-quality, matte-coated stock for vivid color and photo printing. 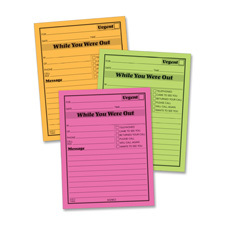 Great for party invitations, birthdays, holidays, announcements and much more. Print your own elegant greeting cards, announcements and invitations with textured matte postcards and your inkjet printer. Heavyweight textured cardstock creates a quality look and feel. Postcards come with matching envelopes. Ultra-fine perforations let you separate cards cleanly and easily. Postcards meet U.S. postal regulations. Compatible with all inkjet printers. Avery offers many easy-to-use Avery templates for many other popular software programs. 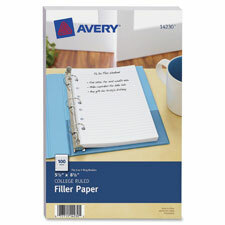 Small format filler paper is seven-hole punched to fit three-ring or seven-ring mini binders and planners. Each heavyweight sheet is college-ruled with no margins. 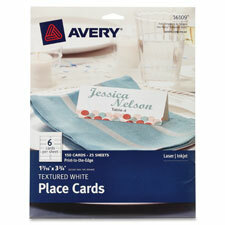 Add an elegant, personalized touch to parties, events, meetings and celebrations with personalized place cards. The textured, heavyweight cardstock stands up to frequent folding, making them perfect for use as place cards, on buffets, or as product description cards at boutiques, trade shows or farmers markets. Personalize and print with free online designs and templates using your laser or inkjet printer. Bright vibrant colors and sharp, clear text can be printed to the edge on both sides for a polished, professional look that will add a special feel to any event. Each sheet includes six uncoated, perforated cards (1-7/16" x 3-3/4"). 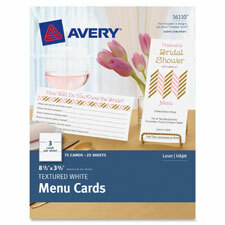 Create beautiful personalized menus for all your special events with these white, textured menu cards. 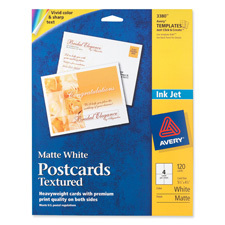 They're also great to use for thank-you notes, invitations, programs and more. The heavyweight cardstock offers a polished, professional look to any celebration or event. These cards are also great for use at trade shows, sales events, open houses and other company events. Make your own custom cards using free online printable designs and templates using your laser or inkjet printer. Colors and text print brilliantly on both sides of the card, allowing easy personalization. Add an elegant touch to all your events with these versatile menu cards. Each sheet includes three uncoated, perforated cards.